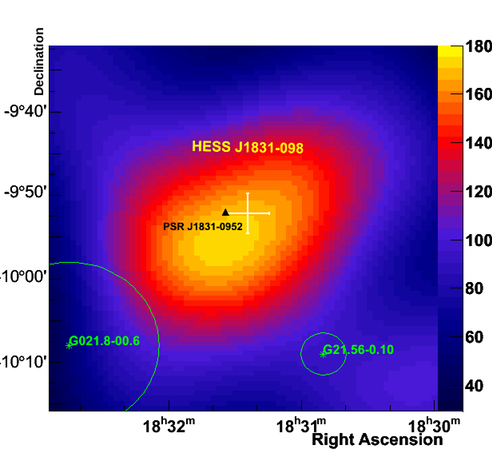 HESS J1831-098, a new gamma-ray discovered pulsar wind nebula? The source HESS J1831-098 and its location in the H.E.S.S. Galactic Plane Survey. HESS J1831-098 (top image and Fig. 1) is a new very high energy gamma-ray source at longitude 21.8 degr. and latitude -0.1 degr., close to the bright source HESS J1834-087 and the young supernova remnant (SNR)/pulsar wind nebula HESS J1833-105 (G21.5-0.9). This source was detected in the H.E.S.S. survey of the Galactic plane, at a flux of about 4% of the Crab Nebula flux and a significance level of 8.4 sigma based on 34 hours of data. HESS J1831-098 has a size of about 0.15 degr. and is spatially coincident with PSR J1831-0952, a 67 ms radio pulsar discovered by Parkes Multibeam Survey in 2006 (Lorimer et al.). PSR J1831-0952 is an energetic pulsar with a spin-down luminosity of about 10^36 erg/s, an estimated age of 128 kyr and an estimated distance of 4.32 kpc (Manchester et al. 2005). This pulsar is sufficiently energetic to power the H.E.S.S. source with an implied conversion efficiency from rotational energy to TeV gamma rays of 1%, a comparable value to the efficiency inferred for other gamma-ray pulsar wind nebula candidates such as HESS J1420-609/HESSJ1418-607 in the wings of Kookaburra (see SOM 2006/04) or HESS J1718-385 (SOM 2007/06) and HESS J1809-193 (SOM 2009/01), see Fig. 2. The angular distance of about 0.05 degr. between the pulsar and the center of the gamma ray emission translates into a projected distance of about 4 parsec, a value well within the range of what is observed for other offset-type PWNe. This type of offset morphology (i.e. the displacement of the gamma ray emission with respect to the pulsar) can be explained either by the expansion of the supernova blast wave into an inhomogeneous interstellar medium (Blondin et al. 2001), such as could be the case for Vela-X (see SOM 2006/05) and HESS J1825-137 (SOM 2005/09), or by the pulsar velocity of about 300 km/s, well within the plausible range of pulsar velocities. The energy spectrum of HESS J1831-098 is rather hard with a spectral index of 2.1 and without a hint of cut off up to 30 TeV. If the nebula is indeed over 100 kyrs old, as suggested by the pulsar age, electrons have cooled very little during that time, implying a rather low magnetic field of about 1 microG. However, the pulsar age may be overestimated since the age estimate depends on an assumption regarding the initial spin period. Although the spatial coincidence with the energetic PSR J1831-0952, the reasonable efficiency and offset, and the abundance of pulsar wind nebula-type VHE sources favour a wind nebula-type emission here, there is yet no report of such a nebula either in X-rays or in radio. Regarding X-rays, the current available data do, however, not exclude the existence of a nebula, as the pulsar lies at large offsets with respect to the center of the field of view of the instruments (Chandra, XMM). Future X-ray observations should provide data to further investigation on this matter. 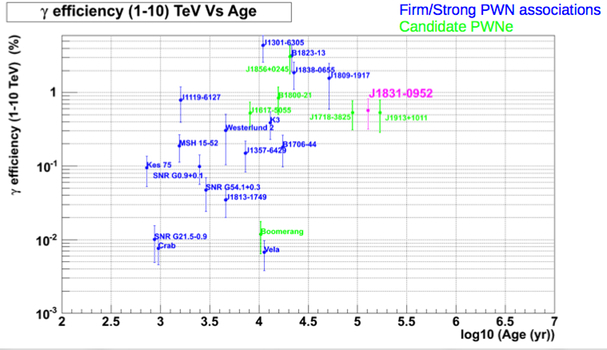 If the VHE emission originates indeed within a wind nebula around PSR J1831-0952, this would constitute a gamma-ray discovered PWN; if so and if the true age is close to the characteristic age, HESS J1831-098 would be among the oldest TeV PWNe. Fig. 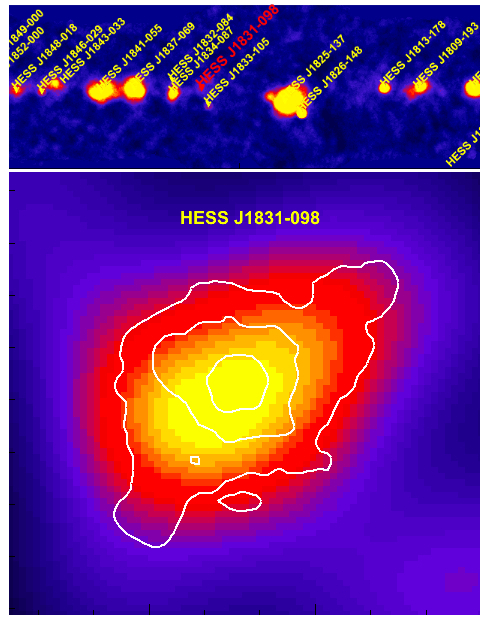 1: Gamma-ray image of HESS J1831-098, with the location of PSR J1831-0952 and of nearby supernova remnants from Green's catalog shown. Preliminary. Fig. 2: Efficiency of energy conversion from spin-down energy loss of pulsars into TeV gamma rays, for a sample of pulsar wind nebulae (PWN) and PWN candidates. HESS J1831-098 / PSR J1831-0952 is shown in pink.